Group travel, event planning, business travel and meeting planning are quick and easy when you book your group accommodations with Choice Hotels®. 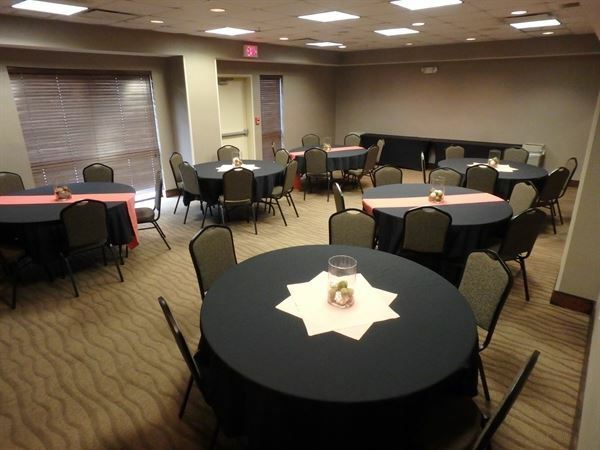 Have your next conference, reunion, meeting or special event at one of the many meeting locations that Choice hotels have to offer. With nearly 1,000-square-feet, our Charlotte meeting space is ideal for your next small- to mid-size event. Our Boardroom is perfect those modest gatherings with 300-square-feet while the Harris Room offers more space with 682-square-feet and allows the option to rearrange the layout. To maximize productivity during your stay, we provide free WiFi and easy access to our business center equipped with copy and fax machines. We also provide special parking for over-sized vehicles. The Boardroom is 260 square feet of flexible meeting space. It will seat up to 8 people classroom style, conference or u-shape. A screen and 32 inch flat screen are available for presentations. Special Features: Complimentary parking for overnight and event guests.